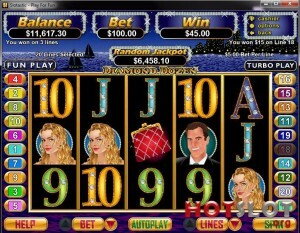 Diamond Dozen (Slot Game) was released in 2008 by Realtime Gaming. The game has a set of 5 reels and 20 paylines. The graphics and visuals of the game are bright, colorful and are full of Diamond Glitter. The theme of the game is inspired by Diamond Industry. The symbols on the reels are theme oriented and include White Diamond, Blue Diamond, Man, Woman, Diamond Ring, Rose, Purse and some high value playing card symbols (Ace to 9). In the background the game has no constant music though some authentic gameplay sound effects could be heard on every spin and winning scored on the reels. The highlight of the game is Diamond Delight Bonus Feature. The game also features Random Progressive Jackpot. Random Progressive Jackpot:The Random Progressive Jackpot can be won when the progressive jackpot triggers at random. The gameplay is available in fun and real play mode but with separate funds. Player can win it randomly during any paid game. Any denomination, number of coins and paylines can be bet to win the jackpot. The higher the wager on each game, the bigger the chances is to win the jackpot. One can’t win during the Bonus games. This diamond themed slot game has a set of 5 reels and 20 paylines. The coin size varies in the denominations of 0.01 up to 5.00 per pay line bet. The minimum bet amount is 0.01 and the maximum bet amount is 100.00 per spin. The maximum payout of the game other than the Random Progressive Jackpot is 3000 coins. The white diamond symbol in the game is the wild symbol. It acts as a substitute for other symbols to complete the winning combinations, except the scatter symbol. Three or more of these symbols scattered anywhere on the reels activate the Diamond Delight Bonus Feature. The blue diamond symbol in the game is the scatter symbol. It can be scattered anywhere on the five reels to form a winning combination provided two or more of these appear. Three or more of these scattered anywhere consecutively on the reels activate the Free Games Bonus feature. Three or more Blue Diamond scatter symbols scattered anywhere on the reels in consecutive order activate this feature. In this feature, player is awarded 12 free games. 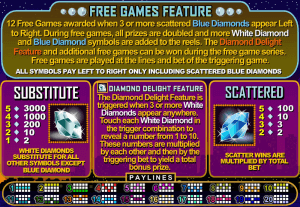 During this feature, all the winning combinations are doubled and additional White Diamond wild symbols and Blue Diamond scatter symbols are added to the reels. When 3 or more White Diamond wild symbols appear anywhere on the five reels, this feature is activated. In this feature player selects each White Diamond in the trigger combination to reveal a number from "1" up to "10". These numbers are multiplied by each other and then by the triggering bet to yield a total Bonus Prize amount. The game is largely based on the glitter and business of Diamond. The name diamond is derived from the ancient Greek. Diamonds are thought to have been first recognized and mined in India, where significant alluvial deposits of the stone could be found many centuries ago along the rivers Penner, Krishna and Godavari. Diamonds have been known in India for at least 3,000 years but most likely 6,000 years.